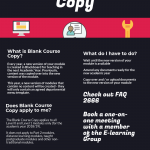 How can we help you with the Blank Course Copy? Level 0 and Level 1 Blackboard modules for 2018/19 academic year will be created with no content. Previously, year by year the content was automatically copied over for all Blackboard modules. 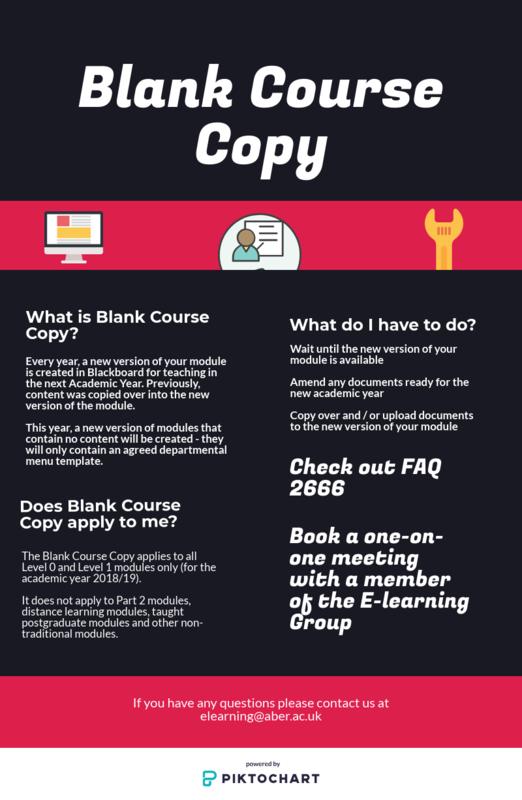 Preparing the Level 1 and Level 0 modules for the next year will require the module co-ordinators to copy over existing and/or upload new material into the new iteration of their module. All modules will contain an agreed departmental menu template that content will need to be organised under. We would like to assist staff with preparing their modules as much as we can. We are happy to come to your office or for you to come and visit us. If you would like to book an appointment with a member of the E-learning Group, please let us know a convenient time and place where you would like to meet. We will also run some training sessions over the next few weeks. These can be booked via CDSAP webpages. We have prepared these FAQs with detailed guideline on copying different elements on Blackboard and produced the information help sheet below. We look forward to work closely with all staff and supporting you in any convenient for you way. This entry was posted in Blackboard, Training and Support, Virtual Learning Environment(VLE) and tagged Blackboard, Staff, Support, Training by Anna Udalowska [aeu]. Bookmark the permalink.